The first cloud computing type is infrastructure-as-a-service (IaaS), which is used for Internet-based access to storage and computing power. The most basic category of cloud computing types, IaaS lets you rent IT infrastructure – servers and virtual machines, storage, networks and operating systems – from a cloud provider on a pay-as-you-go basis. 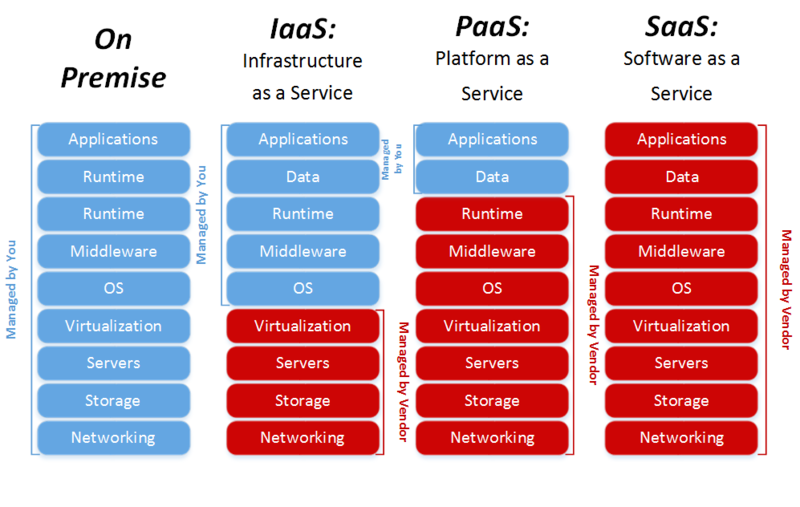 Typically IaaS provides access to networking features, computers (virtual or on dedicated hardware like Memory, vCPU Servers, Virtualization), and data storage space. You need to maintain others like OS, Middleware and Runtime run you application, your application Data, and Application etc. Infrastructure as a Service provides you with the highest level of flexibility and management control over your IT resources and is most similar to existing IT resources that many IT departments and developers are familiar with today. Test and development: Teams can quickly set up and dismantle test and development environments, bringing new applications to market faster. IaaS makes it quick and economical to scale up dev-test environments up and down. Storage, backup and recovery: Organisations avoid the capital outlay for storage and complexity of storage management, which typically requires a skilled staff to manage data and meet legal and compliance requirements. IaaS is useful for handling unpredictable demand and steadily growing storage needs. It can also simplify planning and management of backup and recovery systems. Web apps: IaaS provides all the infrastructure to support web apps, including storage, web and application servers and networking resources. Organisations can quickly deploy web apps on IaaS and easily scale infrastructure up and down when demand for the apps is unpredictable. High-performance computing: High-performance computing (HPC) on supercomputers, computer grids or computer clusters helps solve complex problems involving millions of variables or calculations. Examples include earthquake and protein folding simulations, climate and weather predictions, financial modeling and evaluating product designs. Big data analysis Big data is a popular term for massive data sets that contain potentially valuable patterns, trends and associations. Mining data sets to locate or tease out these hidden patterns requires a huge amount of processing power, which IaaS economically provides. Improves business continuity and disaster recovery: Achieving high availability, business continuity and disaster recovery is expensive, since it requires a significant amount of technology and staff. But with the right service level agreement (SLA) in place, IaaS can reduce this cost and access applications and data as usual during a disaster or outage. Innovate rapidly: As soon as you have decided to launch a new product or initiative, the necessary computing infrastructure can be ready in minutes or hours, rather than the days or weeks—and sometimes months—it could take to set up internally. Focus on your core business: IaaS frees up your team to focus on your organisation’s core business rather than on IT infrastructure. Increase stability, reliability and supportability: With IaaS there is no need to maintain and upgrade software and hardware or troubleshoot equipment problems. With the appropriate agreement in place, the service provider assures that your infrastructure is reliable and meets SLAs.